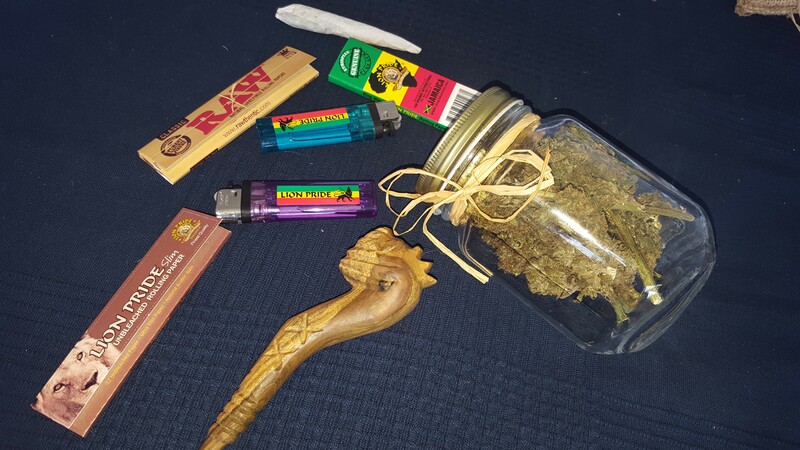 When you book your accommodations through BudandBreakfast.com, this is how you get welcomed in Jamaica. When my husband and I booked our trip to Jamaica, we were as excited about climbing Dunn's River Falls, snorkeling in Ocho Rios, and eating ackee and saltfish as we were about exploring the local ganja. We wanted to discover for ourselves what it was like to consume in the country considered to be the birthplace of weed culture — especially coming from Oakland, where the cannabis is as plentiful as it is potent. Despite its reputation, Jamaica didn't decriminalize weed until 2015. Under current law, adults over 18 are allowed to legally access small amounts of cannabis for therapeutic, scientific, religious, and medical reasons. Possession of up to 2 ounces is a petty offense, and residents are allowed to grow up to five plants for personal use. Tourists with a medical card from their home country can legally purchase ganja in Jamaica, but for now there's only one place to do so — Kaya Herb House, Jamaica's first medical cannabis dispensary. It's equally easy to get weed through underground channels. The accommodations we booked — a private villa in Runaway Bay — through the cannabis tourism website BudandBreakfast.com included ganja among its amenities, but at just about every tourist attraction we visited there was someone offering ganja for sale. The day we arrived, a friend of our host hand-delivered a spliff, a pipe, packs of rolling papers, a jar full of cannabis, and a reminder to alert the on-site groundskeeper whenever we needed more. It was the groundskeeper who later told us that pretty much everyone in Jamaica knows how to grow ganja, and that as far as the curing process went, we were looking at it: They put it in a jar. The slightly damp, sticky stalks given to us were teeming with seeds, which made grinding and rolling a challenge. We eventually resorted to using a knife, a cutting board, and a rolling machine to get the job done. My husband remarked that it reminded him of the weed he used to smoke growing up in Berkeley during the 1980s. There was no mention of strains or effects when it came to our ganja — to find out what was going to happen, we'd simply have to get to smoking. After recovering from the giddy disbelief that we were actually smoking weed in Jamaica, we settled into the experience and noted the earthy freshness of its flavor, the smoothness of the smoke, and the mellowness of body and mind that felt more like an elevation than a high. We felt chill but engaged, not overly stimulated as with a sativa or too sedated from an indica. It was herb that worked with whatever we were doing — which, to be fair, was mostly reading and lounging — and we found ourselves comfortably smoking it all day without feeling super stoned or out of it. At first I was surprised by how few Jamaicans we actually saw consuming ganja, but perhaps I shouldn't have been — after all, public consumption isn't allowed and can result in a ticket. But then again, anything ubiquitous doesn't typically stand out. For example, when we finally made it to Kaya Herb House, our guide seemed to have more to say about the cafe, pizza station, and juice bar than about the actual dispensary. But with its warm woods and slick display cases, the place spoke for itself. To one side of the expansive main room was an elegant dab bar where a dose of concentrate was just $5. (Everything was listed in U.S. dollars.) The opposite wall featured several awards Kaya Inc. had won for its herb, and the seductive smoking lounge behind it was furnished with a couch so large it resembled an unfolded futon. Customers are welcome to hang there and smoke all day until closing. When it came to product selection, nothing was said about strain differences and we weren't asked which ailments we hoped to address with cannabis. As our guide outlined the few strains they were selling that day, she passed along a small jar with a huge bud inside and invited us to check out the trichomes. No containers were opened and we weren't asked to smell anything. Instead, the jar came equipped with a small magnifier and a light, enabling us to see the frosty herb in microscopic detail. In addition to flower, they were selling pre-rolls, hash, cannabis oil, seemingly one type of vape pen, infused lotions and creams, and an endless array of accessories, from rolling papers and pipes to stash boxes and those cool magnified jars. There were no edibles because they aren't legal yet, our guide explained. I had a medical card so they entered me into their system before I could make a purchase, but even without a doctor's rec, I would simply have had to sign a waiver in order to be allowed to buy. (You also need an ID to get inside.) We settled on an indica pre-roll of a strain called 9-LB Hammer and a small lighter for $12, as well as a Kaya tote bag for $20. Even though decriminalization happened just three years ago, weed doesn't seem to be that big of a deal in Jamaica. Maybe that's because of the culture's acceptance of it as a spiritual and therapeutic resource. But Jamaicans know that tourists think weed is a big deal, hence the ganja sales at the public beach and the premium dispensary experience offered by Kaya. We were down for all of it. But, in case you're wondering, I'll choose my Oakland homegrown to Jamaican ganja any day. An exhibit documenting the underground cannabis industry ends its stint in Oakland while setting its sights on the rest of the country.